These baked mini mac-and-cheeses are incredibly cute and amazingly tasty. 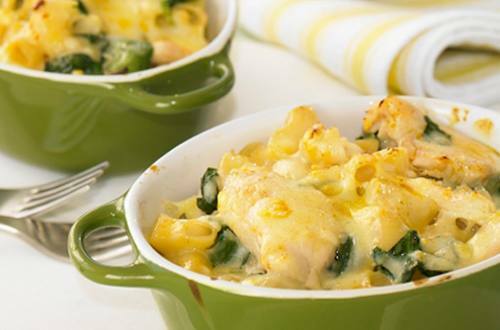 Laced with baby spinach and lean chicken breasts this easy macaroni looks gorgeous on the table with a tossed green salad. What a unique way to do a macaroni and cheese recipe! 1 Prepare the Macaroni Cheese following packet instructions using the milk, water and spread. 2 Stir through the chicken half way through cooking time. 3 At the end of cooking time, stir through the spinach. 4 Spoon the Macaroni into four ovenproof dishes and sprinkle over the grated cheese. 5 Place under a preheated grill until golden brown, remove from grill and season with cracked pepper. 6 Serve this easy macaroni with a fresh salad.